A FAMILY-OWNED hotel in Louth is suing Google because it says the search engine giant gives web surfers the mistaken impression it is bust. 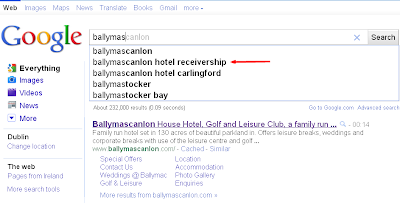 The four-star Ballymascanlon House hotel, located outside Dundalk, has applied for a High Court injunction to prevent the Google search engine from suggesting it is in receivership. Ballymascanlon is not in receivership and the Quinn family, who have run the hotel for 70 years, say it is trading successfully. Google declined to comment on the legal action. 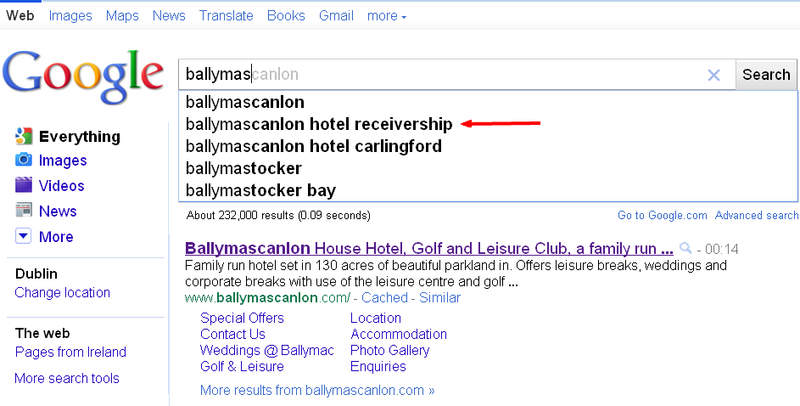 When search engine users type the first seven letters of the hotel's name into Google, the website's automatic prompting service, Google Instant, throws up the suggestion "Ballymascanlon hotel receivership". The hotel, one of the most popular wedding venues in the northeast, says it has been contacted by brides who had booked weddings there and were "in tears" after seeing the Google prompt. When a snippet is thrown up on the user's screen in response to his search, it points him in the direction of an entry somewhere on the web that corresponds, to a greater or lesser extent, to the search terms he has typed in ... it is for him to access or not, as he chooses. [Google] has merely, by the provision of its search service, played the role of a facilitator. In this case, however, it may be that Google will face difficulties in running that defence. Looking at both Metropolitan International Schools and the recent Italian judgment, three factors seem likely to be important. First, unlike the case of search results, autocomplete suggestions do not merely reflect what is elsewhere on the web but are created by Google (albeit by algorithm). Second, as Google actively censors the autocomplete system it makes it harder to argue that there is no "human input" into the results - a factor which was critical in Metropolitan International Schools. Third (although the judgment isn't entirely clear on this point) the court in Metropolitan International Schools found it signficant that Google could not block all searches against particular terms without also blocking a great deal of unrelated material. In this case, however, it would seem quite simple to remove a particular autocomplete result for this hotel, ruling out any argument based on practicability or collateral damage. Incidentally, I see from the High Court search that the action is listed as QUINN [SENIOR] & ORS -V- GOOGLE IRELAND LIMITED 2011/4784 P. I was surprised to see Google Ireland named as a defendant, as I understand that Google's search functions are run by Google Inc., California - a distinction which tripped up the Red Cross in their action seeking to identify a blogger hosted on Google's blogspot. In that case the Red Cross eventually had to seek the permission of the court to substitute Google Inc. as the defendant, and I'll be interested to see whether this happens in this case also. On some level, this is a Skynet moment. Effectively, an algorithm is being sued - which infers a certain amount of intentionality. I know, it's the company etc. but still, it's pretty weird. The algorithm didn't write itself, someone decided how it should act. There can, and frequently, are unintended side-effects in algorithms. I can see Googles point - they just show what people search for. But I can also see the Hotels point of view - they're potentially suffering damages. Ironically the greater media coverage this story gets - the more people will run that search for themselves; thus making it rank higher. And you can imagine a multitude of other situations where people won't be happy with the auto-complete suggestions. It's also possible that it's open to abuse, and iirc there are other cases (no links sorry) where search engines have been accused of unfairly de/prioritising competitors links. I'm surprised it has taken so long as unlike copyright infringement, when you want to remove defamatory material, like this hotel, you're winning from any extra publicity the case brings as opposed to facing the Barbara Streisand effect - bringing more publicity to negative press. Ireland to extradite "Boards.ie hacker"?